Wheels ordered (Two 7.5x16" and Two 8x16" Compomotive MOs in gold). Speedo sensor fitted, although the magnets have yet to be glued in their final place on the propshaft, due to the cold weather. 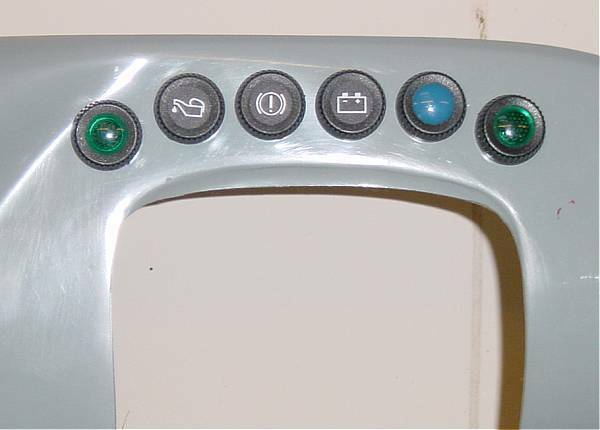 Dashboard holes cut for gauges and warning lamps. Now needs to be covered. 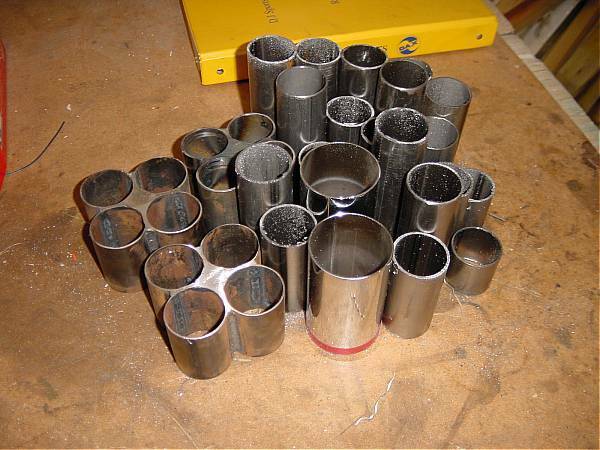 All tube was cut for the exhaust headers/branches ready for welding. I decided that the only way to proceed with the exhaust welding was to call in a professional. To that end, on the 5th January, a guy came round and tacked all the header/branches together and took them away to TIG weld. Trev's Tip:- Make sure that you have removed ALL combustible materials from around your car before welding on or near it (especially GRP 'sawdust'). Let's just say that I had cause for concern when a very small GRP dust fire occurred and burnt itself out unnoticed behind the offside engine mount!!! Not to mention all of the wood sawdust lying around in my Dad's workshop. Hence the tidy up mentioned above. Today (13th) the welder came back with all of the branches welded. An absolutely first class job. You simply cannot see the joins! A quick refit to the car and he was able to tack on the 4-1 collectors and away he went again. Reckons he will have them finished by midweek. The guy doing the welding is charging me £7/hr. Seems as though its roughly 14 hours work to fit, tack, weld, refit, tack and final weld all of the pieces. So that's approx. £100. Add that to the price of the parts from Custom Chrome £500, and the cost of chroming the headers say £100, the full cost of the system will be £700. A saving of £1300 over the DJ price! E-mail me if anyone local (West Kent / East Sussex) building a Rush, would like the welder's 'phone number. 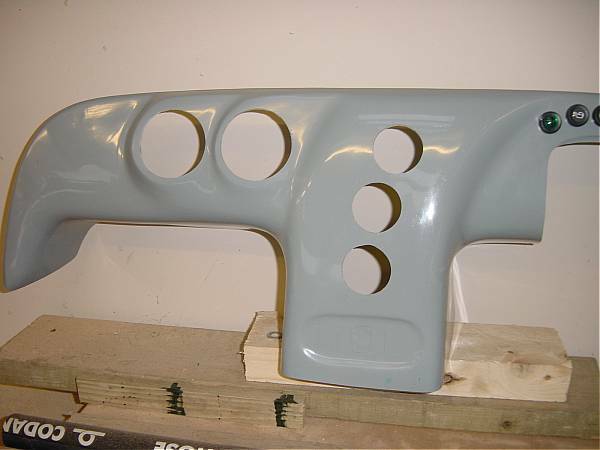 Meantime, apart from cutting holes in the dashboard for all of the various instruments etc., I have begun to recondition the front uprights prior to fitting. Like the rear hub nuts, the front nuts are torqued on to over 200 lb/ft and therefor needed a very hefty 3/4" socket bar and scaffold pole to shift. Fortunately my brother-in-law has a torque wrench that runs up to 250 lb/ft when it comes time for the refit. Collected the completed headers from the welder's yesterday. An absolute first rate job and at such a reasonable price. I had telephoned him earlier in the week to ask that any sharp edges were machined away or radiused to 2.5mm as per the SVA manual. Over and above that he polished the headers to a standard which means that they can go straight to the electrplaters for chroming this week. I've temporarily covered the headers in light oil to prevent rust forming. I contacted my nearest electroplaters last week to ask if they would accept the headers after being used on the car. They said that they would prefer not to so the start-up is delayed until after the chroming is done.! Otherwise, I completed the front upright refurb in preperation for fitting next week by when, the wheels should hopefully have arrived. Trev's Tip:- When fitting the front hubs back into their respective carriers, the left hand thread hub fits to the right hand or off-side carrier. This is denoted by the letter 'R' stamped into the front, wheelside face of the hub. This is the opposite situation to the rear hub nuts where the LH threaded hub is used on the left hand or near-side of the car. 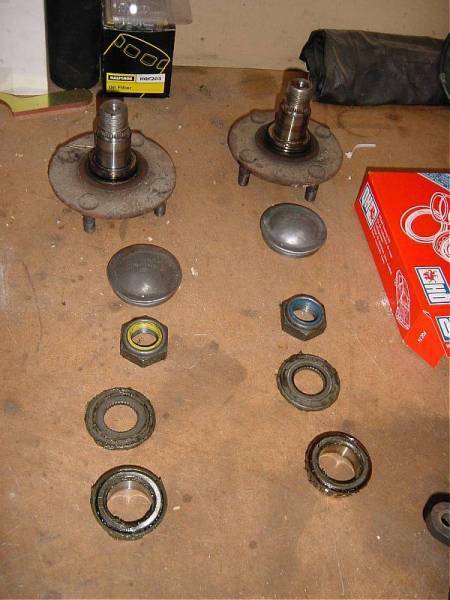 The reason for the difference is that on the rear the nut is on the outside of the hub and on the front the nut is on the inside of the hub, IYSWIM. In the meantime I've brought the front calipers home to paint in two-pack paint. I've decided that 'Speed Yellow' caliper paint would suit the gold and green colour scheme quite well. 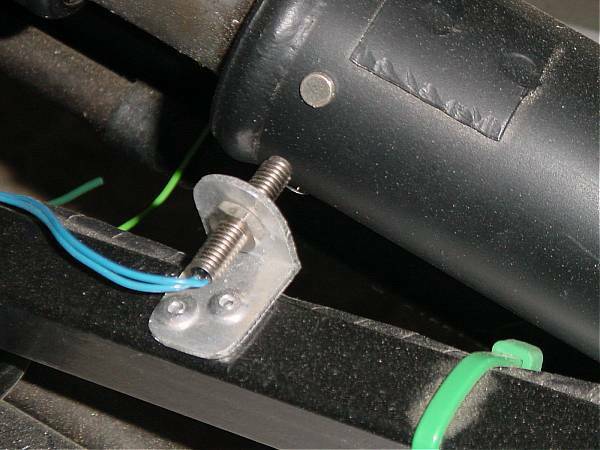 I've also been crimping on all the dash loom connectors and fitting them to the various warning lamps and instruments ready for the 'Big Day'. I was very impressed with Autosparks from whom I ordered additional crimps etc. via the web. Ordered on a Sunday, delivery on Wednesday morning. If the wheels do come by the end of next week and the exhaust headers are chromed, the next problem to overcome is getting the car off of its stands before trying to start it up! Well, things are not going at all according to plan. Firstly, it would seem that with my exhaust headers now finished, they cannot be chromed satisfactorily. The reason for this is that they cannot easily be polished in the area where the branches are welded to the 4-1 collector and hence the chrome will not 'take' and therefore will not last. Secondly, I've made a real pig's ear out of painting the front brake calipers. There is however something I can do about both problems. 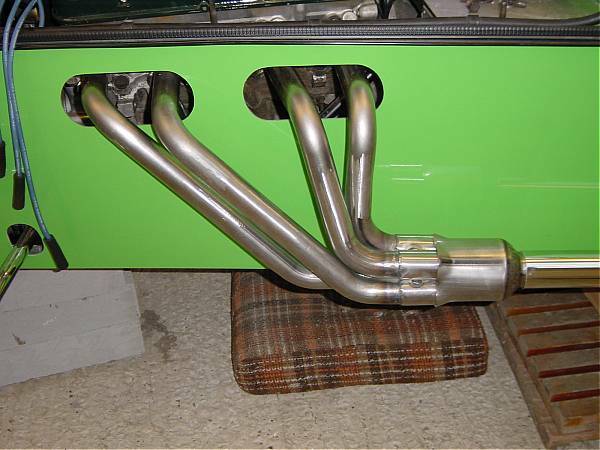 "I have recently had a pair of mild steel 4 into 1 headers made for my Rover V8 kit car. The intention was to have them chromed but the electroplaters are saying that the chrome will not 'take' in the areas they are unable to polish. So I am therefore looking at alternative paint & bake style coatings. I would like to know whether you would be able to coat my headers with your 'Black Satin' 'Cermakrome' or 'Colourguard' products and whether your process would be able to cover the difficult to polish areas where the header branches are welded into the 4-1 collectors. Each branch is made from 38mm diameter mild steel and the longest is approx 60cm. 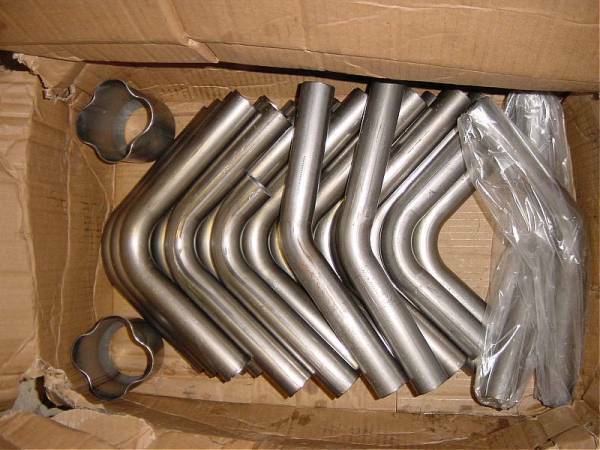 Additionally the outlet of each 4-1 collector is a pre-chromed pipe of approx 60mm diameter and 30 cm long, would that chrome present your process with a problem or would you acid dip the whole header prior to painting and baking." "No problems as we are doing what you ask all the time. Suggestions would be internal ceramic coating plus either Black Satin outside for total of £171.60 or Cermakrome at £241.80. The latter looks really good and will not blue like chrome. Machine polished for consistent finish.We are able to coat on top of chrome after our preparations. Please add £12 return carriage and VAT to all prices. Turn around about 3 weeks at this time. Regards Peter Carter." This price compares favourably with the price for chrome which was estimated by one electroplater at £200 or so. So I think this is the way I shall go, and I do like the sound of ceramic coatings on the inside! Only down side is that I'm in Kent and they're in Warrington. Oh and the three week turnaround! As for the calipers, another coat might improve matters or else it's out with the Nitromors!